If you want to learn how you can put air to work producing fast-growing, high-density, healthy and delicious crops, then read on. 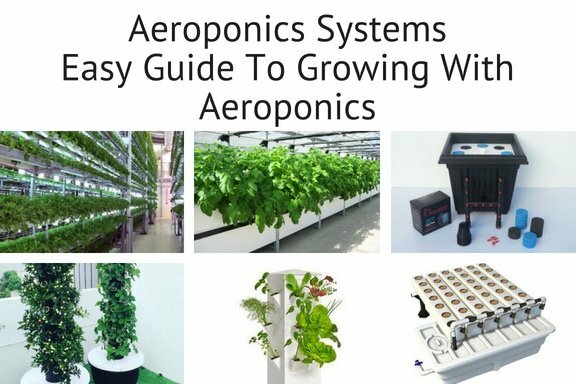 In this easy guide to aeroponics systems, we will walk you through many of the questions about home aeroponics growing systems that you may have, starting with the basics. Aeroponics is a system of cultivating plants where the roots are suspended in air and the plants get their nutrients from a water-based solution delivered to the roots by a fine mist or spray. While the idea of growing plants by spraying their exposed roots with nutrients has been around for more than a century, today’s aeroponics systems are the results of NASA research into high-tech sustainable agriculture for the future. There is some disagreement over whether or not aeroponics is a subset of hydroponics, since the word “hydroponics” describes any soil-less growing system that delivers nutrients to the roots of the plants via water. Hydroponic systems involve liquid water in motion and typically require some type of growing medium to deliver moisture, nutrients, and oxygen in a way that prevents rotting. Aeroponics systems generate a mist of tiny water droplets to feed the plants and have air or the misty environment as the growing medium. Others look at it a little differently, noting that hydroponics systems require some kind of soilless growing medium, which may be the nutrient solution, itself, while aeroponics systems use no growing medium beyond starter cubes or others used to get plants going that haven’t yet developed roots. Read more here about the different types of hydroponics systems. In aeroponics systems, the plant roots are suspended in the air, providing them with maximum exposure to oxygen. Note that while plants breathe in carbon dioxide from the air as part of the process of photosynthesis, roots need oxygen to aid in the absorption of the nutrients that are used to build new structures and grow. The plants are held in place by a frame at the top of an enclosure using either small baskets or foam plugs that grasp the stems gently but firmly, allowing the roots to grow unfettered into the chamber below while the crowns grow upward. The root chamber is an enclosed container that needs to keep out light as well as pests while keeping humidity in, yet also allows some fresh air to enter so the roots will be sure to have plenty of oxygen. The nutrient solution is pumped from a reservoir through the misters or sprayers at regular intervals so the roots are fed and kept from drying out. In advanced systems, the sprinklers are set to come on for several seconds and then turned off for a few minutes, so this on-off cycle will occur hundreds of times a day. The key factor in aeroponics is the ability to consistently produce the right size water droplets. NASA experiments have shown that 5-50 microns is the optimal size for encouraging roots to absorb nutrients. “True”aeroponics systems typically generate droplets of between 20 and 50 microns, although all systems that use sprayers or foggers, regardless of the size droplets, are still commonly considered aeroponics. Why Choose An Aeroponics System? One of the main advantages of choosing an aeroponics system is that you can grow plants very quickly. With air as the medium, roots have greater access to growth-stimulating oxygen than other systems provide. Additionally, by growing plants in air, there’s nothing inhibiting a plant’s expansion, so they don’t need to use up any energy struggling to push their roots through a physical medium. Another advantage of aeroponics is that it allows for high-density planting. And since the plants have minimal contact with anything physical, harvesting the plants and controlling disease is very easy. The result of these factors is higher yields. Yet another major advantage of aeroponics is that it is highly water efficient, requiring notably less water than other hydroponics systems, especially when you recycle any run off solution that may occur. Ideally, farmers are able to fine tune their systems to the needs of their plants to achieve maximum nutrient efficiency, along with maximizing water efficiency – and that translates to long-term cost savings over other types of hydroponics systems. For situations where weight may be an issue, such as rooftop or indoor farming, aeroponics presents the advantage of being lightweight, since they are so light in water usage. And another plus: You don’t have to worry about finding the right growing medium or combination of media, as you do with most other hydroponics systems. The trick of ensuring that your plants get just the right amount of moisture is instead determined by the timing of the spray cycle. What Are The Disadvantages Of Aeroponics? If the prospect of growing plants in nothing but thin air sounds too good to be true, then you are probably ready to learn about some of the disadvantages of aeroponics systems. First and foremost, the technical requirements make it a more complicated system than other types of hydroponics – requiring a more expensive initial investment to build. Whereas other systems may call for a simple submersible fountain or pond pump to move the nutrient solution around the system, aeroponics systems require more formidable pumping power to deliver those tiny water droplets to the plant roots. Aeroponics systems also require more monitoring and maintenance. For example, you will need to keep a close eye on the water pressure and output of the mister heads, as they tend to become clogged by buildup of minerals in the nutrient solution. So you’ll want to have extras on hand to replace those that need cleaning. Also, you may want to design your system so you can make adjustments to the misters as the root masses grow and become denser. Perhaps one of the biggest disadvantages of aeroponics systems is that they are vulnerable to power outages because the spray cycles occur in such short intervals, which are set to ensure that the exposed roots receive the moisture and nutrients they need but don’t dry out in between spraying. Even a relatively minor hiccup in the cycle can be very hurtful to the plants. And finally, it can be tricky to correctly calibrate the nutrient content of the solution for aeroponics systems. With a fine mist as a delivery system, you don’t have much margin of error. That’s why careful monitoring and constant tweaking of your system is a must. Despite these challenges, aeroponics systems can be a very rewarding way to grow plants, and many home growers have had great success! Can I Build A DIY Aeroponics System? Building your own aeroponics system allows a great deal of freedom in deciding what materials to use and how to best utilize the space you have available for it. It can be done pretty easily, depending on which type of system you choose. Of course, there are many variations on the three basic system types outlined here. That’s the beauty of building your own aeroponics system: You can customize your setup, mix and match techniques, or create a hybrid system, applying your own creativity and innovation to develop the system that best fits your needs, desires, and lifestyle. High-pressure systems are considered by purists to be the only true aeroponics systems. This is because the high-pressure system is the only one that actually generates a fine mist of water droplets that are the optimal size for encouraging nutrient absorption and plant growth. High-pressure systems usually use diaphragm pumps or reverse osmosis booster pumps to produce ideal-sized atomized water droplets. To ensure you consistently have the proper pressure, you should look for a pump that can generate at least 100 psi. And if you are thinking of expanding your system in the future, you might as well invest in a strong enough pump to start with. You can extend the life of your fancy pump by using a pre-pressurized accumulator tank. This type of tank has a rubber bladder that divides it into two spaces: one for the nutrient solution and another for pressurized air. It offers the additional benefit of keeping the water pressure constant as the misters pulse on and off. Very important: Make sure to install a pressure release valve on your accumulator tank to prevent a catastrophe in case of any problems with the pump. If your pump doesn’t have a built-in pressure switch, be sure to install one of these, as well. The electrical solenoid is plugged into your relay timer to start and stop the flow of solution according to your desired cycle times. The tubing is used to carry the solution from the tank to the misters inside the growing chamber. You’ll want to use mister nozzles that produce an atomized mist but don’t deliver it at high velocity, as this can damage the fine hairs on the roots of your plants. More tubing will be needed to remove any run off solution that occurs, although ideally, the misters and timers are set to minimize over-spray and maximize absorption of the liquid by the roots. Keep in mind that every system is different. For example, some aeroponics farmers choose to forego the expensive pump and just use a pressurized accumulator tank, while others use a good pump but skip the accumulator tank. It’s ultimately all up to you. Sometimes referred to as “aeroponics droplet systems” or “soakaponics,”low-pressure systems are the most popular choice for those who want to build their own DIY aeroponics system because they are simpler, cheaper, and less technically challenging to build and maintain. These systems can be as simple as a reservoir for the nutrient solution, a high-capacity water pump that can run 24/7, tubing, and some miniature sprinkler heads – all of which can be set up within the enclosed growing chamber. Low-pressure systems provide great root system oxygenation, if not the ultra-rapid growing speeds that you get with high-pressure systems. For the best results, position the sprinkler heads so they can spray the roots from above, allowing the water to trickle down through the root masses. A third option for aeroponic growing systems is to use an ultrasonic fogger, such as those used for theatrical productions and Halloween haunted houses. However, this option goes in the opposite direction than that of low-pressure systems, producing droplets that are too small, which causes roots to grow an excess of hairs at the expense of the lateral root systems that sustain plant growth. Other issues with ultrasonic foggers include the fog dropping to the bottom of the container and the plates tending to clog up with mineral deposits. Aeroponics farmers have been experimenting with foggers in combination with other systems, with varying degrees of success. Are There Any Aeroponics Systems I Can Buy? If you want to read more about hydroponics and aeroponics, check out this article explaining the different types of hydroponics systems.